For all upcoming events and programs, please visit Freo Youth or the Youth Action page. Click here to view the recent Volcom skate competition. 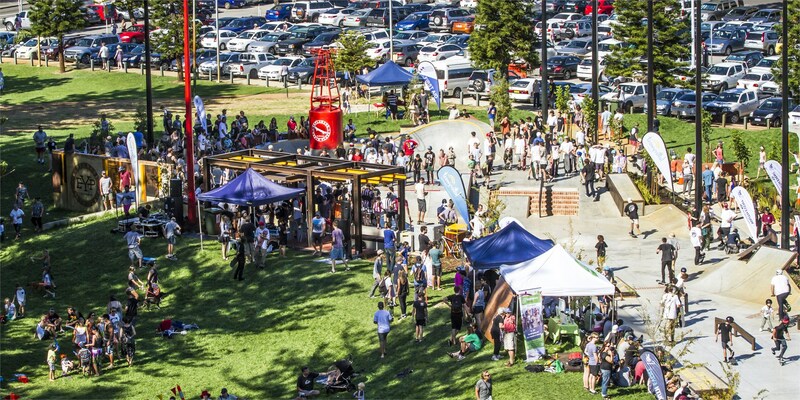 The plaza attracts multiple user groups, including the traditional wheeled sports of skateboarding, BMX and scooter riding, but also includes Western Australia’s first outdoor parkour park and inclusive of stage areas, seating and viewing areas. The hard and softscape design elements have been designed in a way which integrates with the existing landscape. The Esplanade Youth Plaza has attracted the attention of Worldwide Landscape Architecture and the Department of Culture, Youth and Media in Belgium as well as across Australia. The Esplanade Youth Plaza has received acclaimed attention, accolades and awards. 2014 PLA State Award of Excellence–Playspace Award of Excellence for projects over $1 million. 2014 PIA National Australia Award–Urban Design. 2014 PIA State Award–Presidents Award. The Esplanade Youth Plaza received a commendation in the "Presidents Award" category. 2014 AILA Victorian Design Award-Australia Institute of Landscape Architects. The grand opening of the Esplanade Youth Plaza was held on Sunday 13 April 2014. The EYP has received much praise and acclaim by Skateboarding Australia. It was even ranked as the number one skate spot Australia wide before it officially opened. The family friendly event was open with all ages clinics and kids entertainment throughout the day. The official unveiling and speeches took place at 12 noon. Pro athletes showcased their skills in BMX, scooters, skateboarding and parkour demos immediately after. The Dismantle workshop reopened. People tried out slacklining which is like tightrope walking. Food and entertainment was also available all day. A number of clips were made during the construction phase. One of the design features of the youth plaza strongly incorporates Fremantle's marine significance. The city has endeavoured to link the connectivity between the Esplanade and the Fishing Boat Harbour through featured marine buoys. Marine buoy featured in EYP bowl. Progress clip from beginning to Christmas 2013. The Esplanade Youth Plaza is located at the south eastern corner of the Esplanade Reserve. The location was carefully considered based on being centrally located and highly visible, easily accessible (pedestrians and vehicles), integrating well with existing social and play facilities and the availability of nearby public toilets. The total area of the youth plaza is 4 130 sqm. This comprises 2 500 sqm of landscaping and mounding and 30–35 new trees. In response to community feedback and to minimise the loss of green space, concrete/hard surfaces will cover 1 630 sqm, or approximately 2 000 sqm less than designs released in March 2013. The loss of green space now represents 4.5% of the overall reserve. These figures are explained in detail below. The Esplanade Youth Plaza creates an inner–city hub for young people and families to enjoy. The plaza also provides a location for future youth festivals and events and will become a significant tourist attraction for Fremantle. The Esplanade Youth Plaza cost $1.6 m, including $600 000 funding provided by Lotterywest. seating and audience viewing areas. Stage two will consist of a basketball quarter court and public BBQ area. The final design was the outcome of a community engagement process that gathered design ideas, comments and suggestions from a diverse range of stakeholders. Consultation with the community regarding the Esplanade Youth Plaza began in October 2012 and concluded in April 2013. Community members were invited to provide input via surveys and a series of workshops (facilitated by Convic) in early 2013. Fremantle council adopted the draft design Esplanade Youth Plaza at the Wednesday 24 April 2013 ordinary council meeting. The final design was released on 12 July 2013. 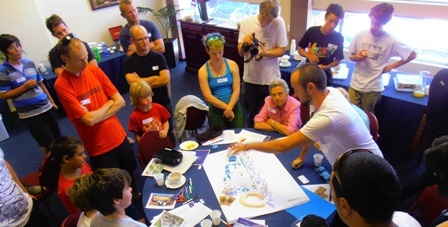 In order to ensure that a diverse range of stakeholders, group and opinions were represented, the City sought feedback from the community through a variety of mediums: a face-to-face survey of young people attending skating workshops held during the October 2012 school holidays, an online community survey, two pre-design workshops, two concept design workshops and a CEO appointed working group. Participation by the community in the various types of consultation is summarised below. establishment of a CEO working group. All of the information collected from the community was used to inform the development of the final design (below). most people feel the key to the success of the youth plaza is the extent to which it activates the location. Most people feel the open areas allow for an inclusive atmosphere and social space. The integration of the mound as a seating area, an open air cinema and public art components were all well supported. wifi connectivity, exhibition space or urban art areas. All comments were considered for inclusion in the final design.